Someone at Microsoft must have decided to end piracy once for all; and someone must have got this brilliant idea: Offer Windows 10 upgrades for free! A decision which can revolutionize the way software and tools are being bought and sold, Microsoft has decided to offer Windows 10 upgrades for all, even for pirated version. Reuters reported this news yesterday from China, a country where Microsoft is fighting hard to end piracy. The fact that this statement was made in China makes it even more interesting, as it gives clear cut message to all pirates out there: The game is over. In March, 2014, we had given a faint hint of such an offering for Windows 8.1, but it is being finally implemented for Windows 10. In the month of January this year, Microsoft had announced the birth of Windows 10 OS. 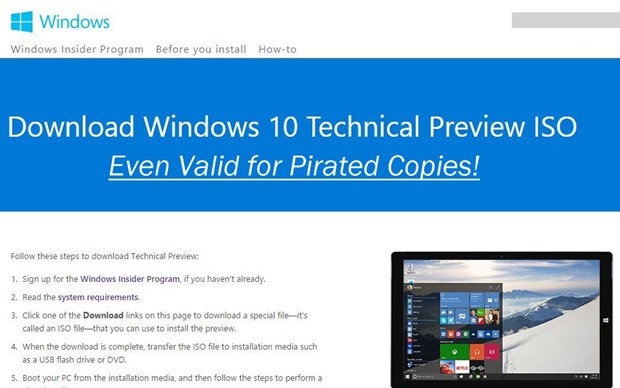 In the blog, Terry had mentioned that Windows 10 would be free for those who have an official copy of Windows 7 or 8.1. It should be upgraded in the first year of its launch. Now, with the announcement coming from China, this offer has been extended to even pirated version of Windows. Last year, while reporting that Microsoft has killed all Android devices, we had observed that in order to fight Apple and Google, they need to focus on developing an eco-system which their biggest competitor have seamlessly done. iOS and Android both are much more than mere operating system; they are a world within themselves, generating billions of dollars of business. Since last few years, they are well on track as well: In 2013, they drastically dropped their price of Microsoft Office and Office 365; offered free MS Office for Android and iOS users ; free Windows OS Mobile for any device which is less than 9 inches; planning free Internet in India using white space technology; luring small scale businessmen with discounted Cloud computing; and it already makes more money from Android devices, compared to their own. By adapting this ‘free for all’ upgraded version, Microsoft has made clear that they have enough customers; they want to make friends now by developing an eco-system of their software, and creating a community of geeks. We congratulate Microsoft on this historic decision to end piracy. I think this news is old as Redmond giant Microsoft later denied they had issued any such offer.